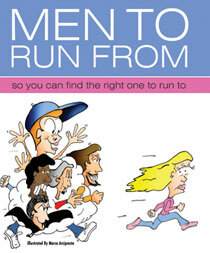 Men to Run from is Catherine Cardinal's witty and compassionate guide to men that teaches women how to spot the keepers from the throwbacks. Women will learn to recognize the telltale signs of types like Microscope Man, The C'mere Go Away Guy, or the Kid in the Candy Store and others whose behavior only leads to frustration and heartache. Should you work on it or cut your losses and get out? Read this if you are ready to stop squandering months, even years, with men who aren't a good match. Use your smarts and find a partner who is capable of building a loving and long-lasting relationship. "Men to Run from gives women needed insight into men and their behaviors, which can only lead to better relationship choices. Every woman will benefit from knowing what category her man falls into, and can then decide whether to run away or follow her expert advice." Julie Spira, best-selling author, The Perils of Cyber-Dating: Confessions of a Hopeful Romantic Looking for Love Online. "Men to Run From May Single-Handedly Launch A Million Happy Marriages! Finally, someone has broken down the complicated world of men and relationships nto an easy-to-understand and entertaining book. Every woman needs this book, and probably every man should read it, too." author of Getting off the Merry-Go-Round: How to Create the Life You Want Without the Fear, Doubt and Guilt. Why do we pick people that are whacked out? Especially when it causes so many problems? Most therapists would say, not clinically speaking, that our 'pickers' are bad. We lack the skills that are necessary to recognize the stable from the unstable. 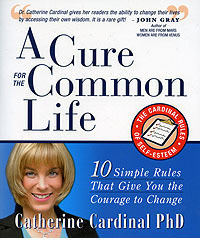 In this book A Cure for the Common Life: The Cardinal Rules of Self-Esteem are 10 simple, common sense principles that teach you how to have enough 'smarts' to pick great people. People that will make you feel safe and appreciated. People that will make your life better, not worse! "Catherine Cardinal gives her readers the ability to change their lives by accessing their own wisdom. It is a rare gift! "Catherine Cardinal distills over 20 years of wisdom gained from counseling real people into a delightful easy-to-read book that prepares the reader to move surely and confidently to joy and success." If You Like Glee You Will Love "Passion of One"! REAL 'FEEL GOOD' MUSIC— AN EXTRAORDINARY CD! 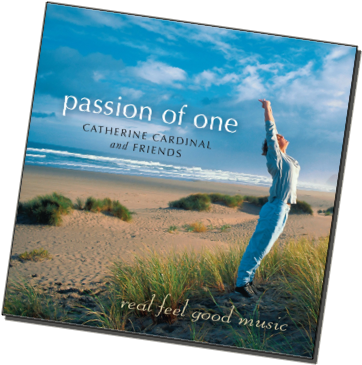 "Passion of One" is a remarkable CD with with songs from some of the most inspired and diverse artists in the industry. Each song compels you to remember who you truly are..radiant, powerful, beautiful, ALIVE…with the "Passion of One!" Gene Bua and Toni Bull Bua, composers, Stars of "Love of Life" for ten years, creators/producers of "Pepper Street"--longest running musical in Los Angeles Creators/producers of "Second Wind-The Musical" –winner of 13 top LA Theatre Awards. Toni and Gene's work has been honored by The White House, Congress and six California Mayors. Their song "Love Finds Me" on the Passion of One CD was chosen to be one of the The United Nations Song of Peace. Brandon Jarrett - composer, "A Baby Story" on TLC; title soundtrack for feature film starring Michael Jackson. He has composed music for TV and films including, "The Dog Who Saved Christmas", "Cinnamon", "A Nanny for Christmas", "Gabe the Cupid Dog', "Diary of an Ex Child Star", and the Red Carpet of the American Music Awards. He has produced Nickelodeon's Ashley Argota and Brandon Hamilton, Neenah Taylor from the movie "Sister Switch", and Les Miserables's Abi Ann, to name a few. Daniel Alexander - keyboards/composer for "Jetliner"; worked with "Little Richard" and "E.G. Daly"
Craymo - Composer--feature song for UN "New Songs of Peace"
Kimberly Riley-Weston - "Sister Act II"; star of "Second Wind"
The CD "Passion of One" was produced by Brandon Jarrett of MoHo Productions and Catherine Cardinal. Click HERE to Listen to an MP3 sample.